Japanese River Levee Fails; Flooding Spurs Evacuation Order For 130,000 : The Two-Way Video footage from the town of Joso, northeast of Tokyo, shows helicopters being used to pluck people from balconies and rooftops as muddy water rages beneath them. 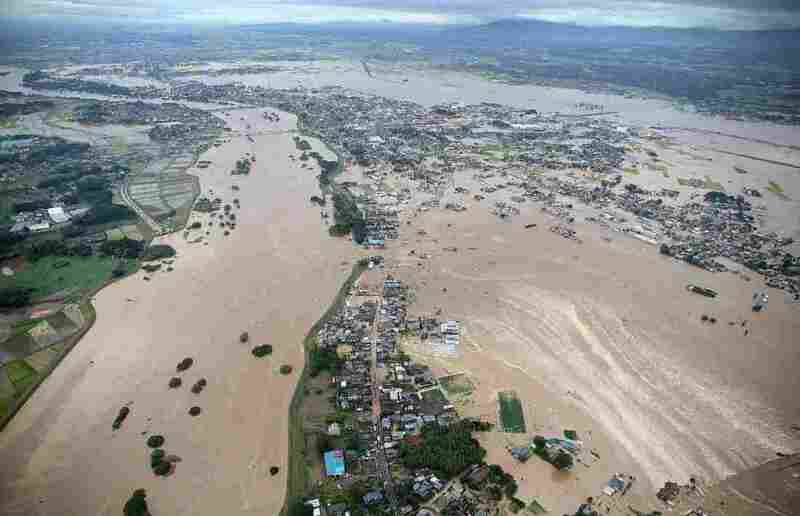 Floodwaters from the burst Kinugawa River (left) flow into a residential area (right) in Joso, Ibaraki Prefecture, on Thursday. The city is northeast of Tokyo. Houses were washed away and people raced to high ground in central Japan on Thursday after a major river burst through a levee overwhelmed by torrential rains. The Kinugawa River's banks collapsed around midday, flooding a residential neighborhood. Nearby areas also sustained severe flooding and mudslides; the government has urged 130,000 people to evacuate the area. Video footage from the town of Joso, northeast of Tokyo, shows helicopters being used to pluck people from balconies and rooftops as muddy water rages beneath them. Japan's Land Infrastructure agency says "the water covers as much as 37 square kilometers [14 square miles]," NHK News reports. "They say the break in the levee was initially 20 meters [65 feet] long — then grew to 80 meters." The authorities say nearly 7,000 buildings may have been flood-damaged in Joso alone. Media reports of potential casualties say at least one person is missing and that three are seriously injured, but with at least three ruptures along the river, officials have not yet given a full account of the human toll. Within hours of the breach, about 2,500 people had been taken to shelters, but the high volume of water flooded two of those shelters, The Japan Times reports. The intense flooding was fueled by heavy rain from Typhoon Etau, which caused dangerous mudslides, submerged train tracks and also cut off power to thousands of households. Floodwaters also "overwhelmed the drainage pumps at the Fukushima nuclear plant," Japan Times reports, citing a Tokyo Electric Power Co. spokesman who said the flooding sent "hundreds of tons of contaminated water" into the ocean.